This game is a rematch of BSG 238 - A Storm to Come. It will be an european time zone 5-player base game. 1) SUBSCRIBE TO THIS THREAD. 2) All players must have their own copies of the game (this is an FFG requirement). 3) Private communication will be by geekmail between me and particular players, all other communication will be by posting in this thread. Please start your geekmail subject line with "BSG 238" and your character name. Feel free to tell me your thoughts or suspicions. I think it's nice to know why you do what you do. 4) To speed up the game, please use Conditional Orders (i.e., geekmail me what you will do if certain circumstances arise). CO's are particularly useful for interrupts, such as Evasive Maneuvers. I will not wait for rare occurrences (e.g., a player using a Strategic Planning on a basestar attack or a viper attacking a raider, or a player using his OPG) unless I have received a CO to that end, or if I feel that discussions in the thread warrant it. I also will not wait for Strategic Planning's on Launch Scout, if there are at least two raptors left. * Normal text for discussions. * Italics for flavour text/fluff – if you can do it, it can make the game more fun, but not required. * Bold for in-game moves and actions. I won't process any decisions/actions unless bolded in the thread or I receive them in geekmail. * Please use your characters banner for every post. You can find this in the Photo Gallery. 6) Please avoid public CO's or bolding actions if it's not your time to act. As I am no friend of card counting please refrain to do so openly. It's okay to state that you think destiny is all negative, but do not elaborate any further. Also please try to quote from memory if you want to accuse someone. Of course all normal secrecy rules apply. 7) On questions of intepretation of the rules I'll try to follow the Unofficial FAQ. Finally my thanks to all the people who made this possible, especially ColtsFan76 and Orphius. You can start selecting your characters and voting on possible variants. The Quorum card limit is in the base game due to the relatively small deck not such important. In general I'm a fan of the Pegasus ICs, but the chances of a human victory in the base game are already in general lower than 50% and I'm a little bit afraid that this would lower their chances even more. The complex destiny makes it more complicated for the humans too, but this makes it more efficient to play a hidden cylon, therefore I wouldn't object. Are there any small rules (from Pegasus) which we could use to compensate for complex destiny and Pegasus ICs? EDIT: Is it ok for everyone if I take good old Tigh? I'm ok with quorum limit and complex destiny, but against Pegasus destiny. Go for Tigh if you want, we already know you're a cylon ! In German "Strom" means river so it could make sense. I become a cylon in PBF games only if I'm far away from any title (Adama, Roslin, Admiral Helo, CAG Kat and Starbuck: Human; Ellen, Non-President Zarek, Chief, Boomer: Cylon). Ok, I choose Tigh, the real Drunken Master. Of course I meant "Storm", thank you. Are there any small rules (from Pegasus) which we could use to compensate for complex destiny and Pegasus ICs? To mind comes the revised Caprica (don't skip jump prep). But as this is your game, I leave all such decisions to you. I think this would be a good idea to compensate Complex Destiny and 10-Quorum-Handlimit (pro cylon) with Pegasus Caprica (pro human). This would be especially nice, because the Complex Destiny makes it more attractive to stay hidden and spike checks, while the Pegasus Caprica makes it less attractive to go out and just bomb the humans with crises. Since I think that playing a hidden cylon is much more interesting for everyone than a revealed one, I would definitively vote for such a "variant". For one who has never played Pegasus, what are the rule changes for Pegasus Caprica and ICs? Pegasus Caprica: The cylon ship activation step on the chosen crises is still skipped, but the jump preparation (if there is one on the crises) is conducted. Pegasus IC: The destiny cards are not played face up. I think this would be a good idea to compensate Complex Destiny and 10-Quorum-Handlimit (pro cylon) with Pegasus Caprica (pro human). Dammit, I appear to have been cornered into the political slot again. Roslin is my favourite character but I can't play her twice in a row. So, for the sake of variety, I'll pick Doctor Baltar. If playing a politician is a big problem for you, Matt, we could also switch something, either with me (I would like to play Tigh, but wouldn't object to Baltar) or with one of the remaining players. I'll take Chief Galen Tyrol. For my starting hand, I'll take 1 Politics, 1 Leadership, and 1 Engineering. Hah! So I'm President again. Oh well. Suckers for punishment you lot, obviously. I'll draw one Politics, one Leadership and one Engineering to start. Sonds good. I'll start the game in a moment. Please post your move and action when you're ready. All of this has happend before. All of this will happen again. Do you want me to compose a geek list for the turn summary? If so, should it be immediatly accessable? If the work as one of the leader of humanity is too much for you, the military can take this burden from you and you can spend your time in your lab cleaning test tubes. Or you do your job and hold the fraking politicians away from me. I have an XO and would guess that XOing the President to his office is the best. Other suggestions? Any one who volunteers to play the press officer? What is with you, Boomer? As long no more cylon fleets are jumping in, we should be able to handle the situation with one pilot outside. Sound good to me, although it'd be a small shame to discard a card as I've got some good cards. But one to switch ships won't hurt. 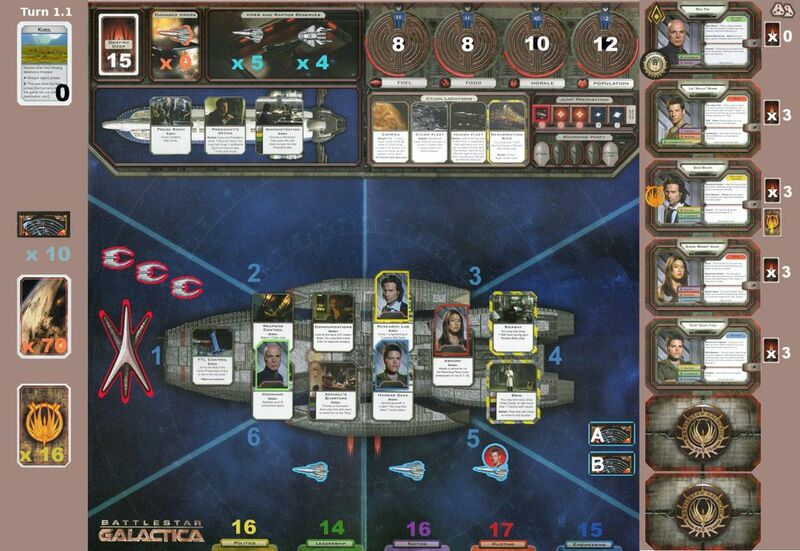 Generally, I've not played Baltar before but it occurs to me that having the extra card draw each turn makes me far more mobile as President - unlike Roslin I can easily run back to Galactica and activate a location if the need arises. It's not really an extra card, since you only draw 4 cards at the beginning of your turn. Roslin is of course a special case, since she has to discard many cards for activating her office. But otherwise Baltar isn't better than others (he draws 4 cards at the start of his turn and 1 in the crises step = 5). I am not sure if I get it correctly. So, you have on low card to discard or not? Since Apollo needs a XO target for his turn and Baltar would be next in turn order, we should man the press office on my turn to give Apollo an optimal target. Either I XO Boomer or I will go. Chief isn't the best choice, since can collect with his smaller hand limit less politic cards and anyway he should stay on Galatica to be prepared for any repairs.